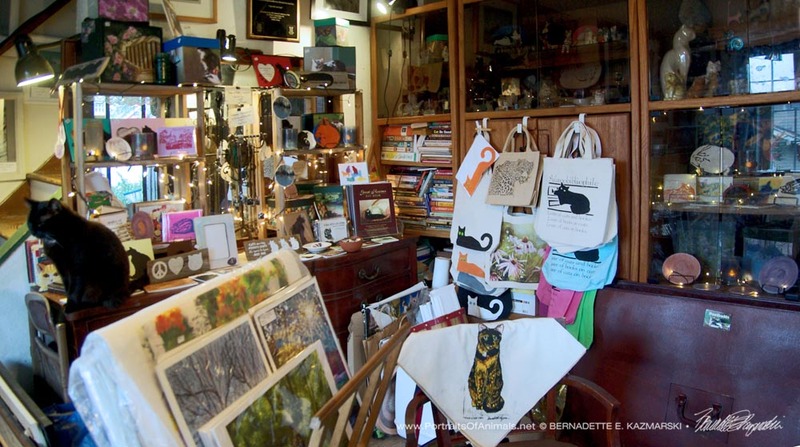 This line of Feline Greeting Cards is 5″ x 7″ , printed on 12 pt. card stock and include a matching envelope, packed in a clear-top white cardboard greeting card box. Cards are blank inside. I find people use these cards for all sorts of greetings, from invitations to parties to friendly hellos and thinking of yous to sympathy at the loss of a pet or even a person. Others have taken their favorites and slipped them into 5″ x 7″ frames for their wall. I’ve included a mix of pastel and watercolor and a mix of styles, from realistic detail to loose impressionistic scenes so you have a choice for all occasions. Cards have only the image on the front, are blank inside, and carry the title of the painting and information about it on the back, you can write inside it whatever you want. Some people purchase them to frame as little prints as well. 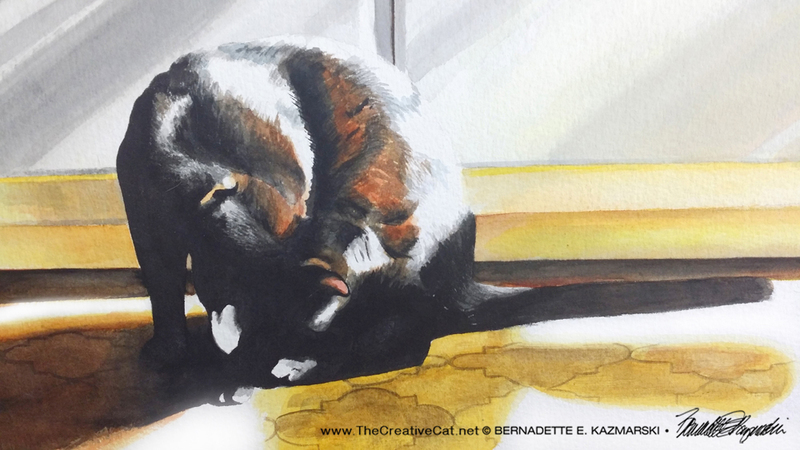 While I render many other subjects now it all began with my cats and the hopeless affection I felt for each of them and all their moods and quirks and manners of affection toward me. This is the gift they gave to me, and I will be forever in their debt, spending a lifetime to pay it off by sharing them with others. 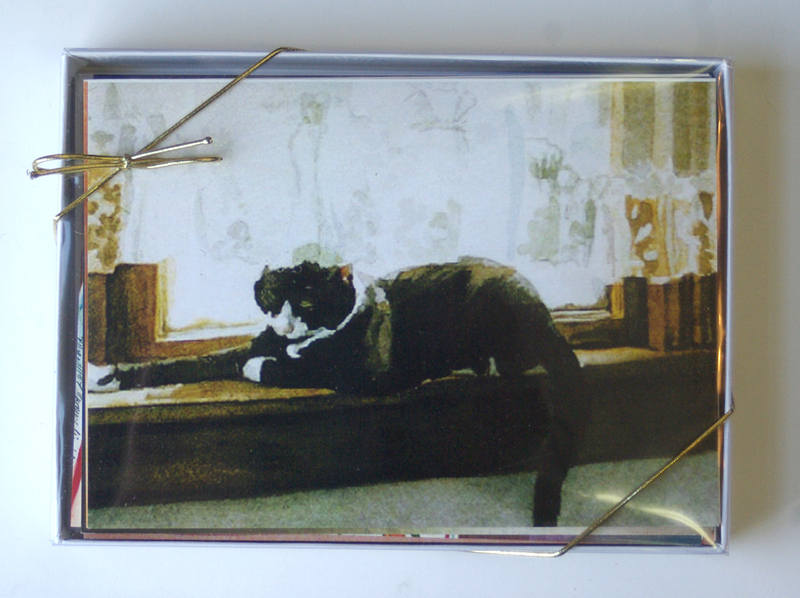 Choose Feline Fine Art Cards in the top left of the grid below, or go to Feline Fine Art Cards, Original Set. 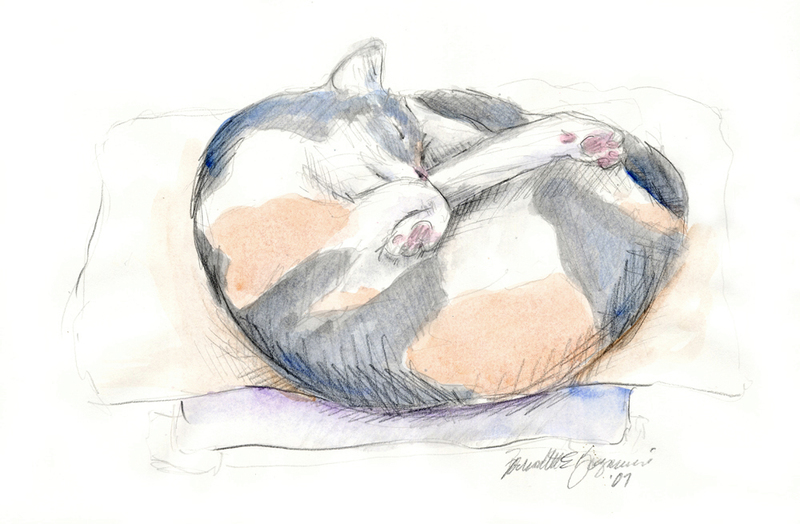 “Peaches’ Nap Spot” Feline Fine Art Card is 5″ x 7″ , printed on 14 pt. card stock and includes a matching envelope. I find people use these cards for all sorts of greetings, from invitations to parties to friendly hellos and thinking of yous to sympathy at the loss of a pet or even a person. Peaches was a perfect model, even when she wasn’t sleeping. Her markings always fascinated me—I was accustomed to torties in Cookie and Kelly, and even the calicoes I had fostered had smaller spots and clearly striped areas. Peaches’ dilute peach and gray and large clearly outlined shapes reminded me an older two-color wall map on cream-colored paper, slightly mellowed with age, where each of the countries were filled with a different color so you could distinguish them at a distance. Here she was sleeping in classic Peaches stretch on her favorite fleece on a chair in the kitchen, above the heater vent, and certain to get a bit of sun at some time during the day. This may have been from 2008, but if you follow my daily sketches I’m sure you can see some of the same pencil lines and watercolor washes you see in my sketches from today. It was from looking at this painting in my studio and remembering Peaches that I decided I really wanted to—and really should—start seriously doing daily sketches again, remembering how pleased I was with this, how I have these little moments to remember from each of the cats I sketched, and how the brief time I did these in 2008 really helped me improve my daily work. Thanks again, Peaches, for all the gifts you gave me. Three years or three decades or three weeks, every adoptable animal like Peaches deserves a good and loving home. 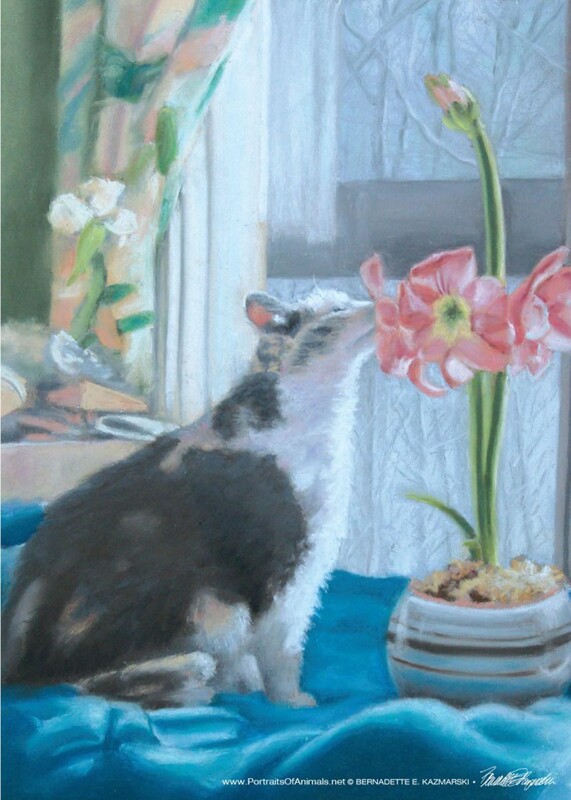 These greeting cards are created from paintings of the cats with whom I’ve had the pleasure of sharing my life, spanning about 20 years of painting my cats. 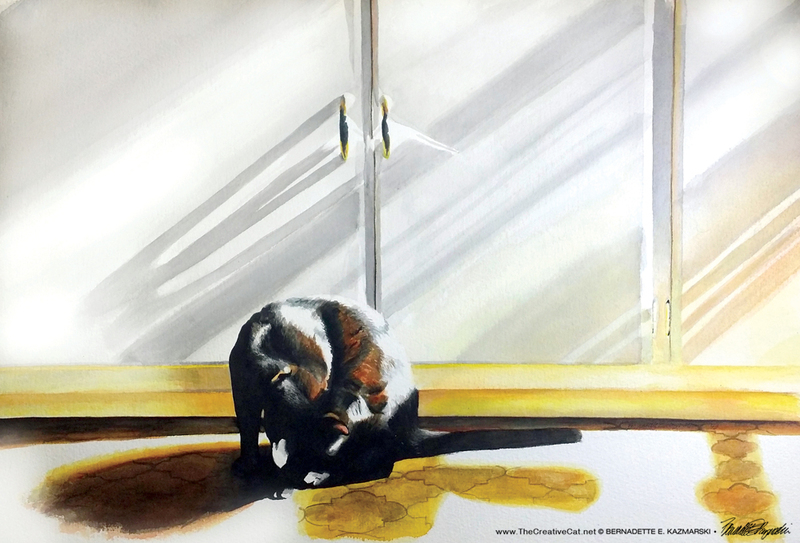 It was through observing their feline grace and their individual natures that I found my muse as an artist and finally decided to get down on paper what I saw with my eyes and felt with my heart. There’s a story behind each one. 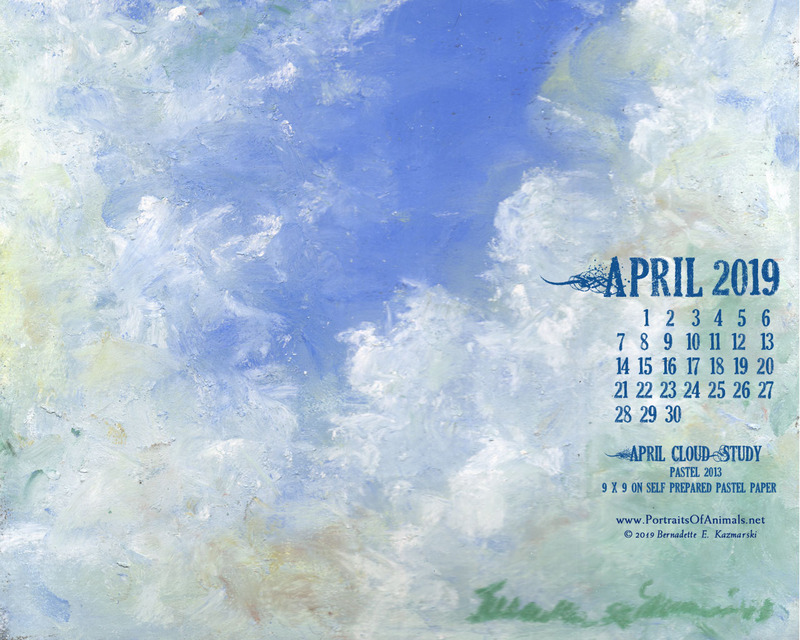 I’ve included a mix of pastel and watercolor and a mix of styles, from realistic detail to loose impressionistic scenes so you have a choice for all occasions. Cards have only the image on the front, are blank inside, and carry the title of the painting and information about it on the back, you can write inside it whatever you want. Some people purchase them to frame as little prints as well. 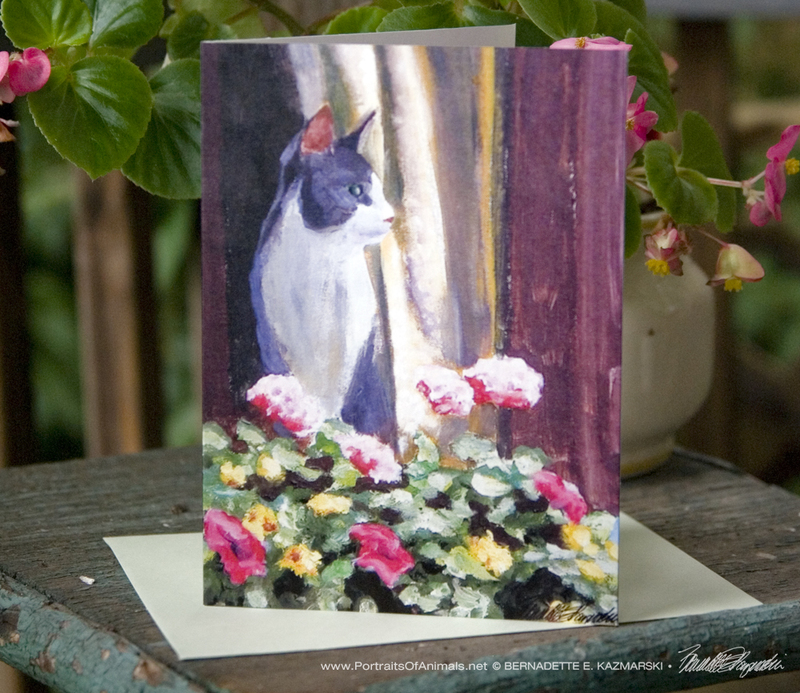 I design other Feline Fine Art Cards as I create art that works with the set, so browse this section for other individual cards. You can create your own custom set of six or a dozen. 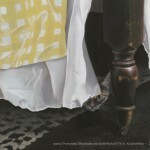 I also offer this image in my Feline Artwork collection. 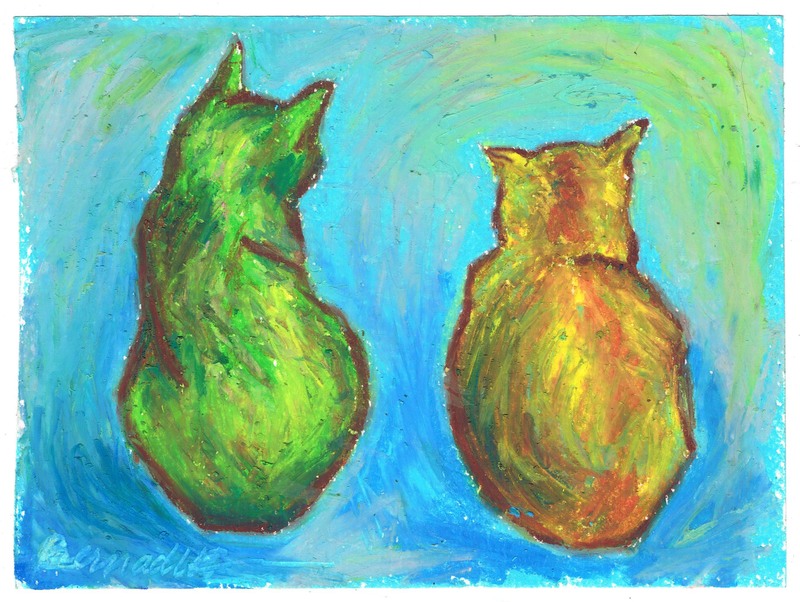 Two Cats After van Gogh Feline Fine Art Card is 5″ x 7″ , printed on 12 pt. card stock and includes a matching envelope. I find people use these cards for all sorts of greetings, from invitations to parties to friendly hellos and thinking of yous to sympathy at the loss of a pet or even a human loved one. After seeing the “Van Gogh Up Close” exhibit I wanted to work the same energy and form I saw in his brush strokes choosing oil pastel to layer and blend the strokes. It’s Giuseppe and Mr. Sunshine, just quietly hanging together on the landing, Giuseppe sitting upright, Sunshine loafing. Originally the sketch had only the two cats but I decided that if I was to truly create homage to van Gogh, I needed to have a background for these two to exist within, especially that lovely cerulean blue and turquoise van Gogh often used. I scraped my name into the oil pastel in the lower left as Vincent often did in his paint. 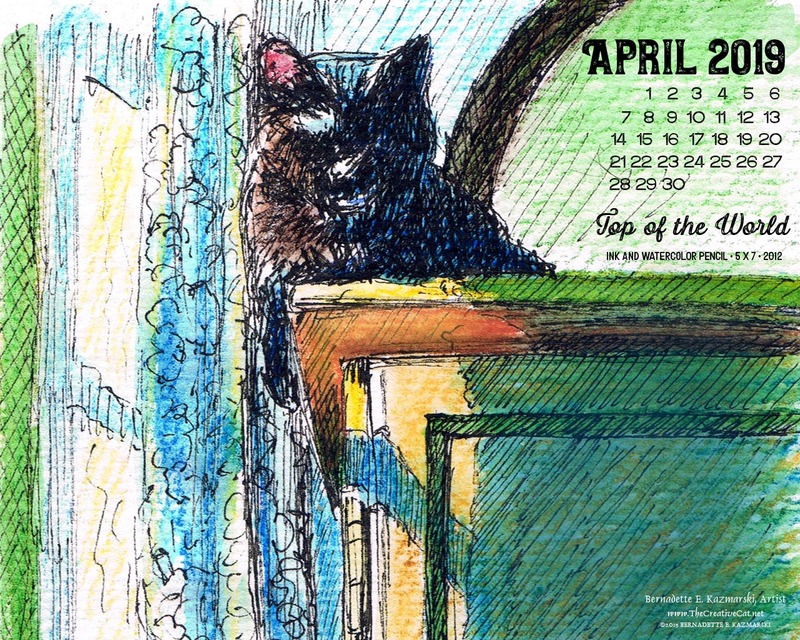 See more Feline Fine Art Cards. 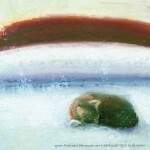 “Afternoon Nap” Feline Fine Art Card is 5″ x 7″ , printed on 14 pt. card stock and includes a matching envelope. I find people use these cards for all sorts of greetings, from invitations to parties to friendly hellos and thinking of yous to sympathy at the loss of a pet or even a person. Others have taken their favorites and slipped them into 5″ x 7″ frames for their wall. illuminated by stark winter light through the window. You know those moments where you walk upon a scene of your cats doing something that you always want to remember, whether it’s a regular habit or a one-time thing? This scene was one of Stanley’s regular habits during his last few years; every afternoon he’d head upstairs with intent and I’d find him curled in the same spot on the bed. 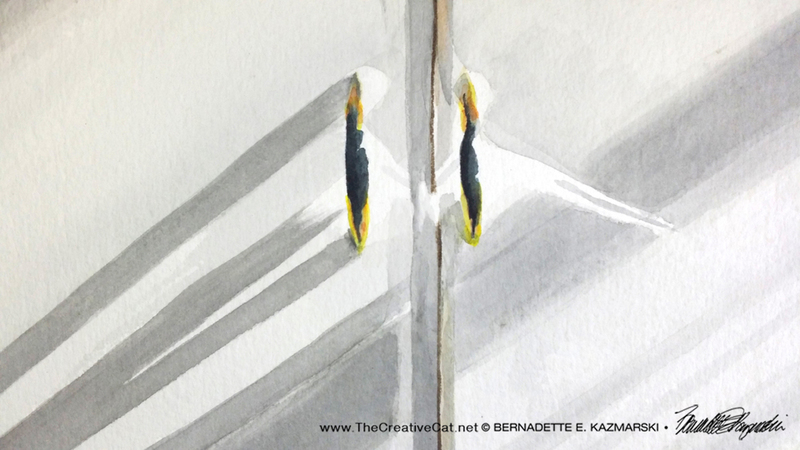 All of my art begins with a moment, be the subject my cats or nature or even a more abstract visual theme. It’s where I go from that moment of inspiration that differs from one work to the next. Sometimes I’ll decide on a more formal portrait, more detailed, more planned, to capture a moment. I’ll take photos and write a few notes and keep it in my files for the day when I have time to follow up, and often this is determined by how often and how clearly my original image appears in my conscious mind—sometimes a painting really wants to be done and I find myself visualizing it all the time, other times it leaves and comes back at a moment that is meaningful. But sometimes I’ll do a quick sketch and leave it at that. The image is simple, it works best small, I only want to capture the mood, and there isn’t enough essential detail to warrant a larger, more detailed piece. But sometimes I’ll do a quick sketch and leave it at that. The image is simple, it works best small, I only want to capture the mood, and there isn’t enough essential detail to warrant a larger, more detailed piece. On this day I went upstairs for something and saw Stanley on the bed. As usual I had my little digital camera with me, the old original 2MP that captured surprisingly good photos. I took the photo below, but in standing there and studying the image I decided I wanted the light, the delicate colors, just a hint of the objects and the sketch began to materialize. I hurried to get my art stuff for the sketch I was visualizing. At his age he slept pretty soundly but I still tiptoed out of the room and ran down the stairs for my stuff. I grabbed my small box of pastels and a piece of my “experimental” drawing paper, choosing a heavy drawing paper to which I’d applied marble dust mixed with gesso and just a little bit of fine fine grit pastel medium, applying it with a brush to have just a bit of texture. 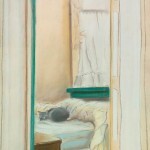 I got to work, standing at the foot of the bed to quickly capture the essence of the scene I visualized in that instant: all the shades of shadow and highlight in the white bedspread, the fold under the pillows and the curve of the mahogany headboard just giving enough detail to know it was a bed, and the pastel winter light full of sun and just a bit of green reflected from the ivy on the tree outside the window. 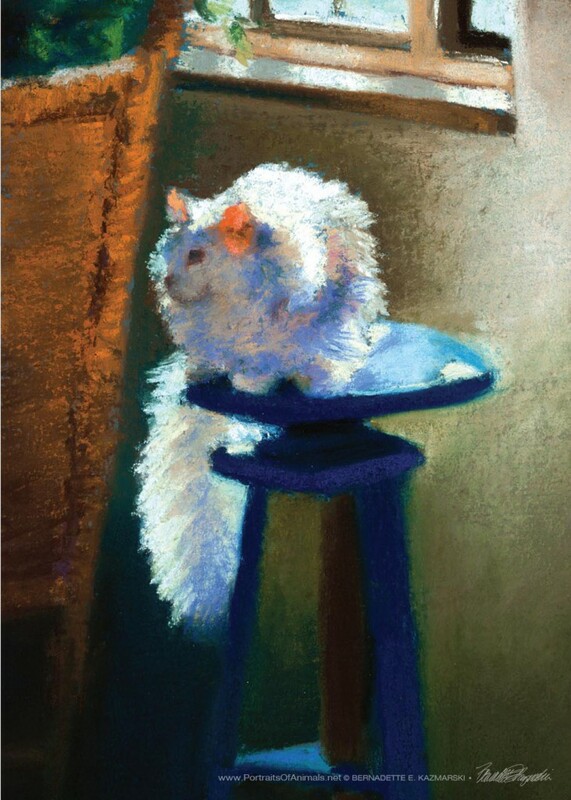 Instead of drawing with the ends of the pastels I dragged them over the surface in layers to get the depth of color and shadows, Stanley himself just in simple tonal colors, the only solid detail in his white paw. Stanley on the bed from February 21, 2003, the day I did the sketch. It was all over in about ten minutes, and though I’d taken the reference photo I never made any changes from that initial inspired session. In its frame, I have allowed the edges to show, mounting it on deep burgundy mat board. I still have this painting, treasure it for its memory of Stanley as he watches over my office, and use it as inspiration for other similar sketches. You’re probably familiar with “After Dinner Nap”, another memorable and inspirational moment. This image could have gone either way, painting or sketch, but in this case I was intent on capturing all the subtle details in his face, and all that wonderful direct and reflected light. This image is also available as a print, and the framed original is still available. 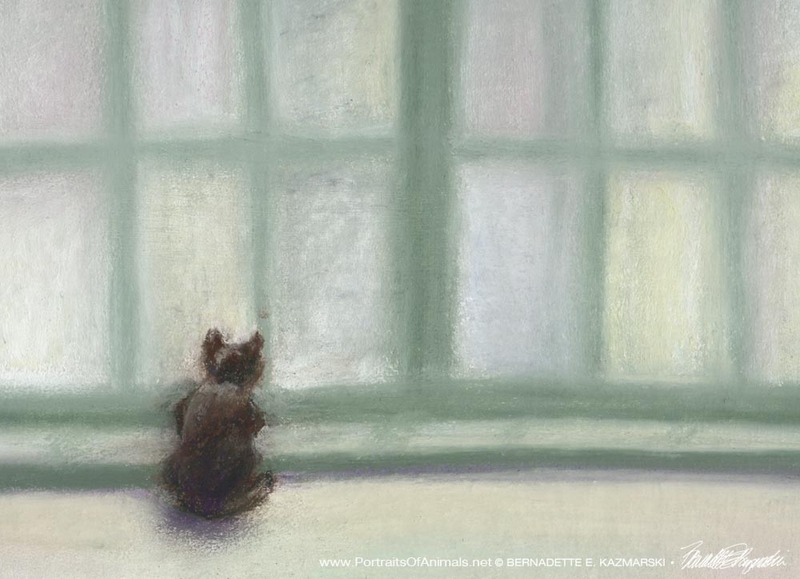 “Namir at the Window” Feline Fine Art Card is 5″ x 7″ , printed on 12 pt. matte card stock and includes a matching envelope. I find people use these cards for all sorts of greetings, from invitations to parties to friendly hellos and thinking of yous to sympathy at the loss of a pet or even a person. Others have taken their favorites and slipped them into 5″ x 7″ frames for their wall. 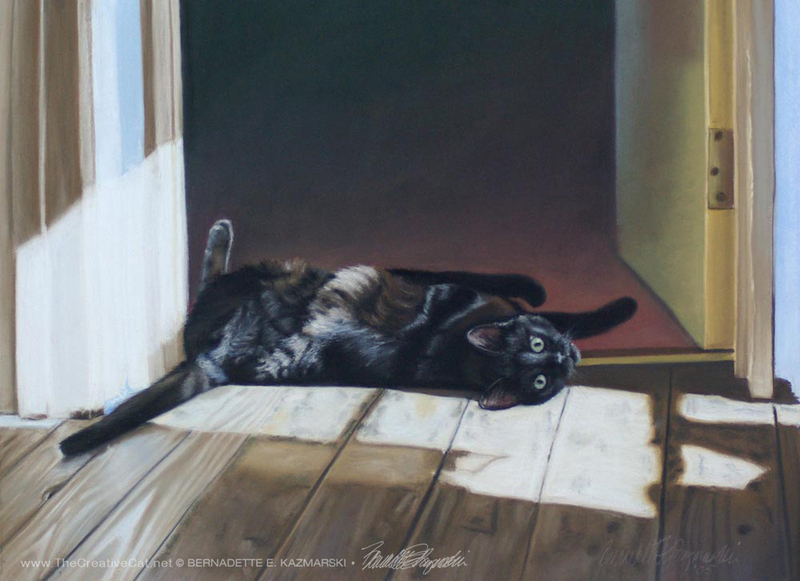 This is my one and only (so far) acrylic painting featuring a cat. Here’s the story. Normally, I’m pretty linear with working on something, focusing on one clear idea at a time. When I’m learning something new I hit points where I’m not skilled enough to do something and need to either work it out there or outside of that piece, or just stop and let the lessons I’ve learned sink in and get back to it when I’m ready to move on. I began this painting in January 2008 from photos I took of Namir in 2005, I think, soon after I’d gotten a big box of acrylic paints and brushes and canvas panels from a neighbor whose aunt had been an artist. I don’t care for the finish on acrylic paints, much preferring oils but not the smells and chemicals, so I’ve just avoided the entire thing. I decided that the gift of free art materials meant the universe wanted me to paint in acrylics, and I wanted to work with a more dimensional medium—I wanted the brushwork, the impasto of layers and colors, the texture of the canvas showing through the paint.I remembered this photo and got started. I hit a learning wall at one point and put it aside to work on commissions. I pulled it out again in April of 2009 when Namir, at 15 with hypertrophic cardiomyopathy, was having increasing trouble with congestive heart failure, kidney failure and related health issues, and I know we didn’t have much time left. 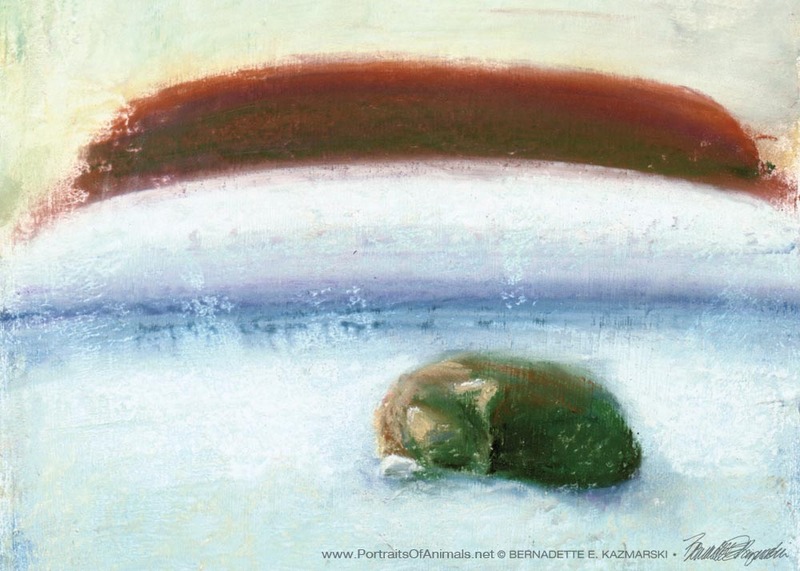 I wanted to work on the painting when he was still with me. He died in July 2009, and again I left it where it had been at that time, and this is what you see today. I love to remember Namir in any way I can, and the area where I keep this windowbox is too shady for the colorful geraniums and petunias and marigolds I’d always grown in it. The pleasant memory of him at the window with the flowers is a treasure to spend time with, a time that has passed, but one I’d probably return to if I could. The canvas panel, and the painting, is actually larger than this, but I cropped it down to the area of it I like and feel is the essence of the painting. I want it to show what I remember most and what I feel is most important, and I don’t need to show the whole scene to do that as I first thought. It’s a canvas stretched on cardboard, not stretchers, so all I need to do when I’m done is cut out the part I want to use and frame that. I’ve done that with others I painted in the same era. For now, I just won’t work on that anymore. That’s kind of freeing! This line of Feline Fine Art Cards is 5″ x 7″ , printed on 14 pt. card stock and include a matching envelope, packed in a clear-top white cardboard greeting card box. I find people use these cards for all sorts of greetings, from invitations to parties to friendly hellos and thinking of yous to sympathy at the loss of a pet or even a person. Others have taken their favorites and slipped them into 5″ x 7″ frames for their wall. 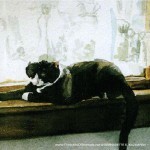 A friend of mine showed me photos of her cats, and this was apparently a typical posture for Buster with his legs stretched out and “looking at his toes”. 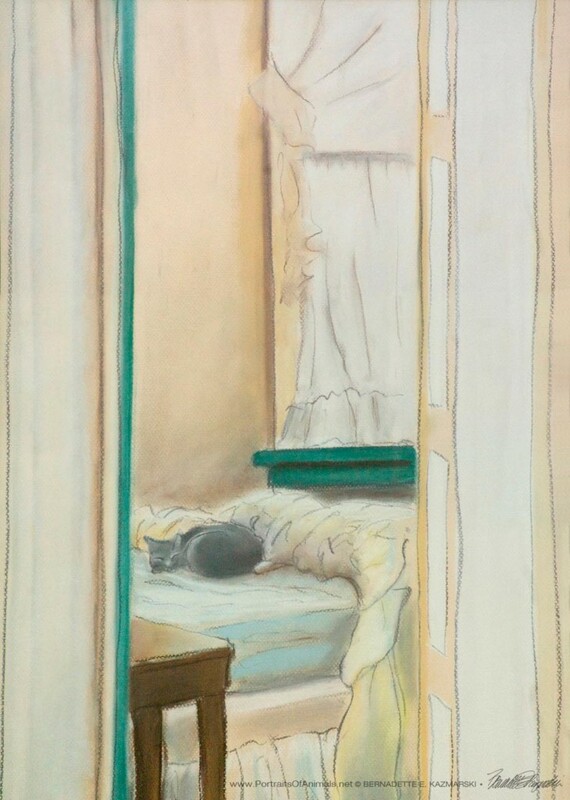 I loved the sheer curtain and the traditional wooden windowsill, but rather than my usual pastel, I decided this would be more interesting as a simple little watercolor. She had just purchased a new home, and his became a housewarming gift. 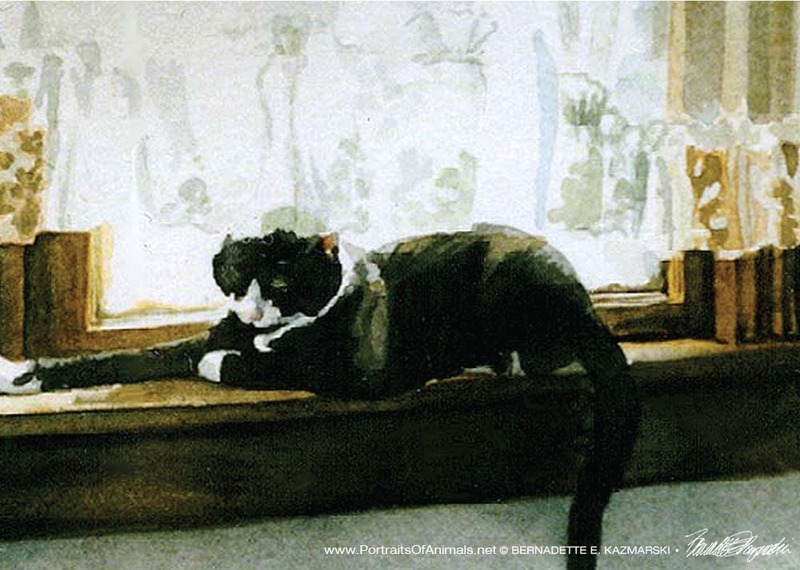 Namir was a great model, and in the years he was with me I think he learned to intentionally strike a pose so that I would take his photo or paint his picture. He might have been posing here, but he was also engaging in a very cat thing, gazing out the back door at the sunrise, and for once my housekeeping comes in handy as the container of stuff that needed to be taken to the basement made a very nice still-life accompaniment. I went to visit a friend and mutual “cat person”, and her new kitten was such a doll, and my friend’s house so beautiful that I had to paint at least one scene! 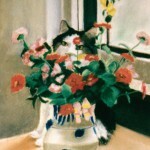 It was just meant to be the flowers and the cloth, but around my house it’s hard to keep the cat out of the picture. Moses made it back upstairs after breakfast before I had a chance to make the bed, and I didn’t have the heart to move her. So I got a sheet of drawing paper and my pastels and did a quick sketch of the scene, finishing it later from a photograph. It was a pleasure to work in a looser style and just to catch the mood, but not all the details. Now, years later, it’s a pleasure to have this memory of a house I moved from long ago, and a happy scene with gentle little Moses. This was something I thought all cat companions could relate to, human and feline. Sophie really thought I couldn’t see her because she thought she blended right in with the flowers. She almost had me fooled until I saw one of the flowers looking back at me and I knew I had to investigate. Her ulterior motive was to eat the flowers, something I hate to clean up after. Fawn was a real live wire as a kitten—always swinging from something and talking about it—and was very attached to me; I had known her from her first moment of life, thanks to her mother, a stray, who honored me with choosing my home for the birth of her kittens. 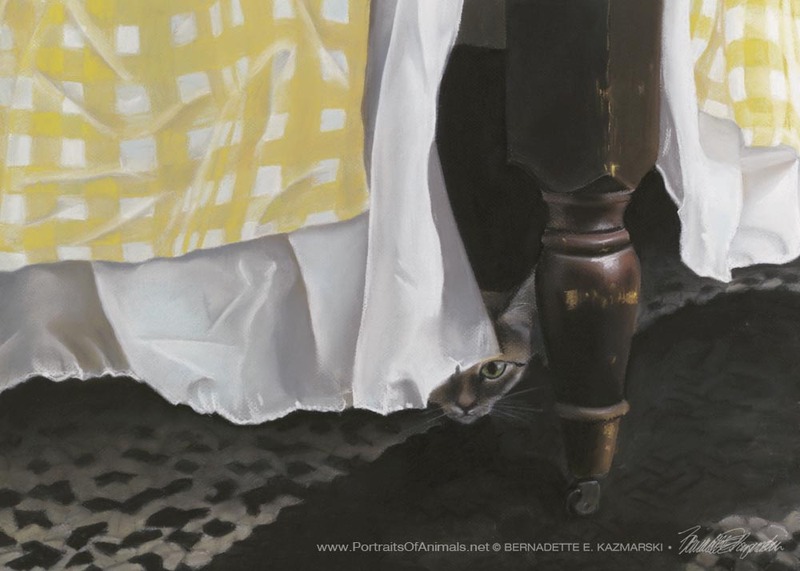 And even though, years later, we’d moved and changed the bedspread and dust ruffle, at least once a day when I went upstairs Fawn still dove under the bed and peeked out, waiting for me to walk past so that she could grab my foot. Nothing is so clarifying as brilliant early morning sun, and nothing chases away the chill of a winter morning. Here, Namir was lulled to sleep by the natural warmth and comfort. While the main body of this work is lit by direct sunlight at that beautiful, long angle, the rest of the work is lit by reflected light. Kelly pauses in the stark pastel light of a winter afternoon through the big north ­window in my studio, absolutely still in contemplation as she watches birds flit about at the feeders or Buddy the squirrel making a fool of himself. 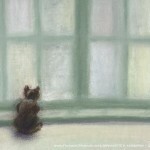 Kelly is petite for an adult cat, making the window seem vast, and the light is so diffuse that nothing has a hard edge. It is a scene I remember even in the heat of summer. 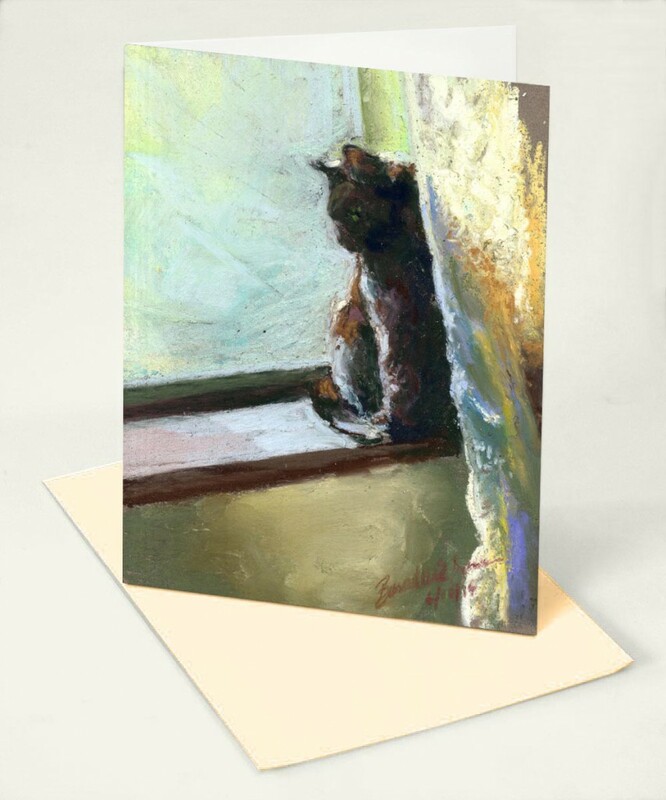 Feline Fine Art Cards are 5″ x 7″ , printed on 14 pt. card stock and include a matching envelope. I find people use these cards for all sorts of greetings, from invitations to parties to friendly hellos and thinking of yous to sympathy at the loss of a pet or even a person. Others have taken their favorites and slipped them into 5″ x 7″ frames for their wall. 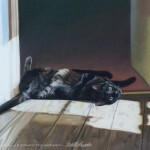 “Buster Lookin’ at His Toes” Feline Fine Art Card is 5″ x 7″ , printed on 14 pt. card stock and includes a matching envelope. I find people use these cards for all sorts of greetings, from invitations to parties to friendly hellos and thinking of yous to sympathy at the loss of a pet or even a person. Others have taken their favorites and slipped them into 5″ x 7″ frames for their wall. 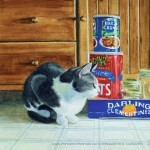 “Darling Clementines” Feline Fine Art Card is 5″ x 7″ , printed on 14 pt. card stock and includes a matching envelope. I find people use these cards for all sorts of greetings, from invitations to parties to friendly hellos and thinking of yous to sympathy at the loss of a pet or even a person. Others have taken their favorites and slipped them into 5″ x 7″ frames for their wall. 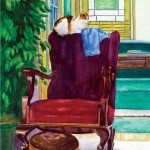 “Holly on the Rocker” Feline Fine Art Card is 5″ x 7″ , printed on 14 pt. card stock and includes a matching envelope. I find people use these cards for all sorts of greetings, from invitations to parties to friendly hellos and thinking of yous to sympathy at the loss of a pet or even a person. Others have taken their favorites and slipped them into 5″ x 7″ frames for their wall. 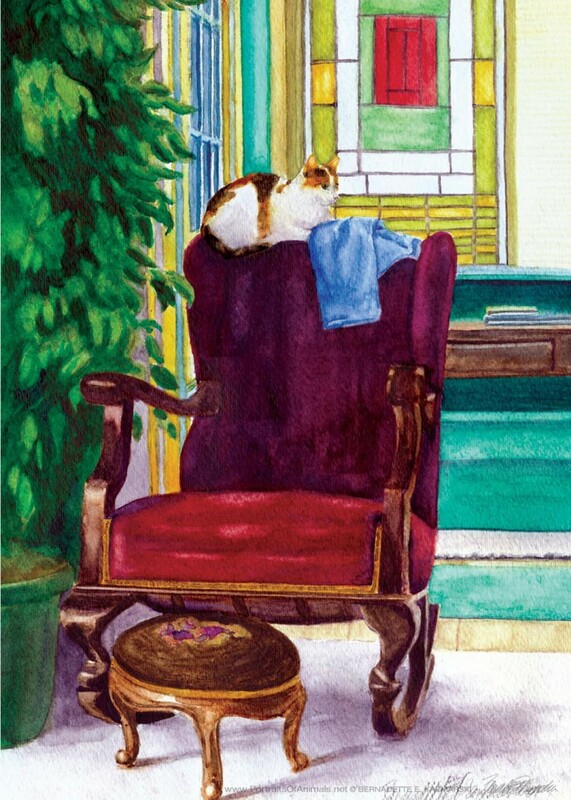 “Interior with Cat” Feline Fine Art Card is 5″ x 7″ , printed on 14 pt. card stock and includes a matching envelope. I find people use these cards for all sorts of greetings, from invitations to parties to friendly hellos and thinking of yous to sympathy at the loss of a pet or even a person. Others have taken their favorites and slipped them into 5″ x 7″ frames for their wall. 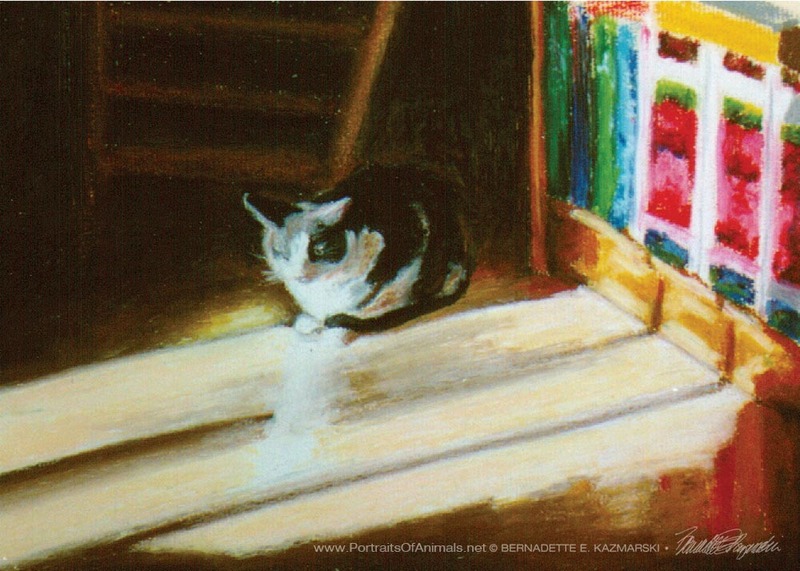 “Sunday Morning” Feline Fine Art Card is 5″ x 7″ , printed on 14 pt. card stock and includes a matching envelope. I find people use these cards for all sorts of greetings, from invitations to parties to friendly hellos and thinking of yous to sympathy at the loss of a pet or even a person. 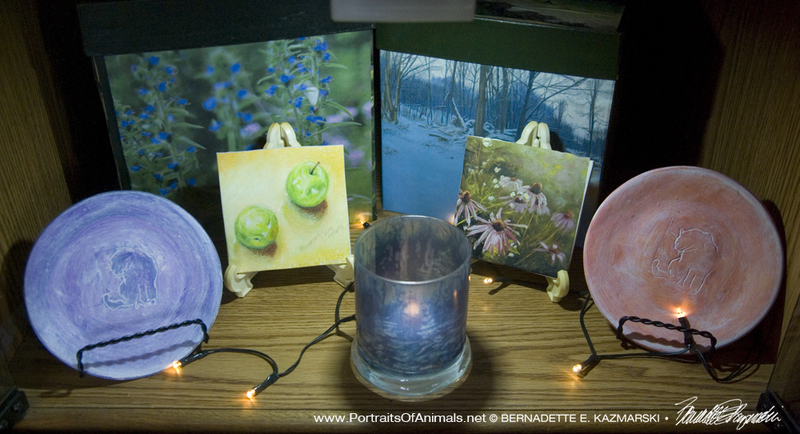 Others have taken their favorites and slipped them into 5″ x 7″ frames for their wall. 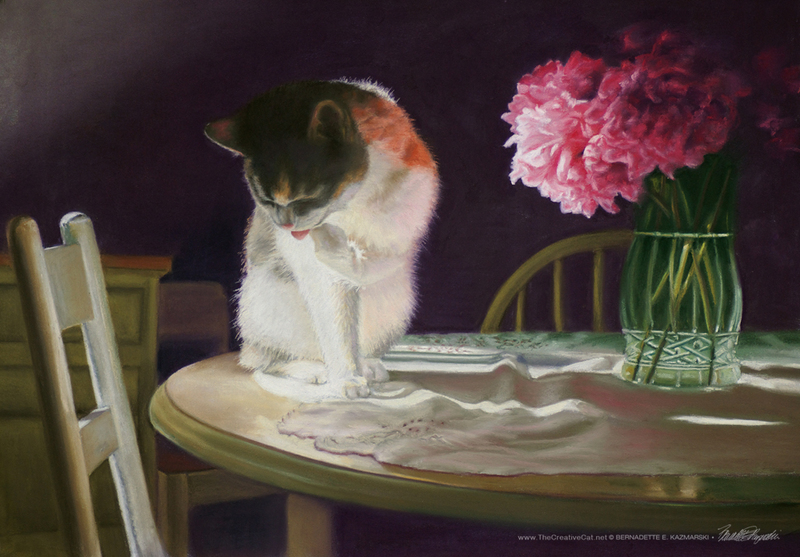 This image was a commissioned portrait, a gift from one friend to another, of a dilute calico kitty named Peaches (yes, another Peaches). 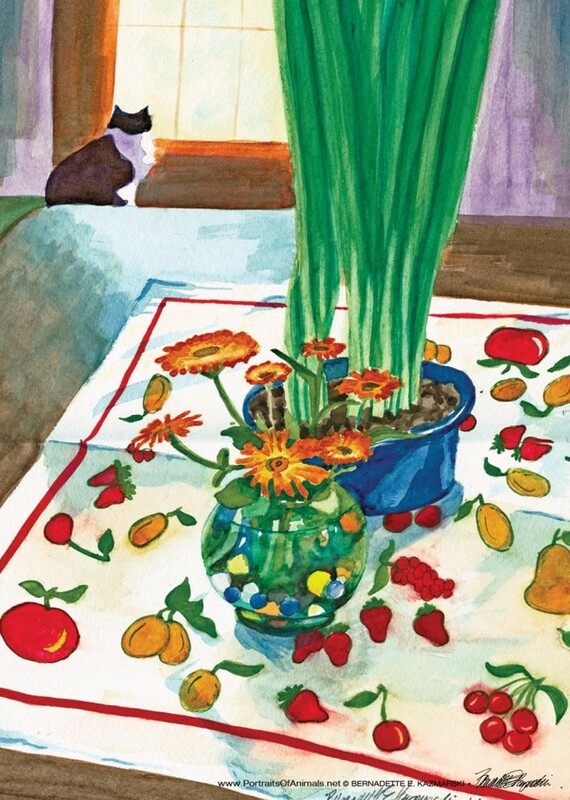 Here is the beautiful story of Peaches and her amaryllis. The gift is both the portrait and Peaches’ recovery. 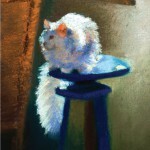 You can also read about the portrait and watch its progress on my site, The Creative Cat. Read “The New Portrait Final” to read the final entry with links to the first and second posts on the subject. 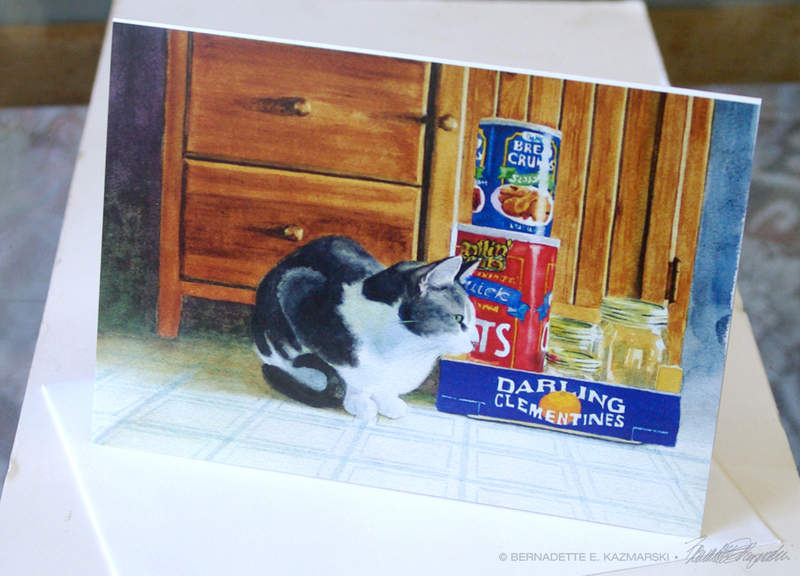 And many thanks to Peaches’ person for permitting me to have her portrait on a greeting card! 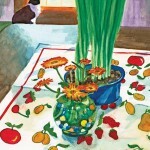 “Spring Morning” Feline Fine Art Card is 5″ x 7″ , printed on 14 pt. card stock and includes a matching envelope. I find people use these cards for all sorts of greetings, from invitations to parties to friendly hellos and thinking of yous to sympathy at the loss of a pet or even a human loved one. Such a lovely spring morning with sunlight so full of color. Mimi was feeling the weather and was everywhere—every windowsill, every spot of sun, challenging her children to wrestling matches, they running off and wrestling with the roll of paper towels. But she allowed herself a few quiet moments to just enjoy the warm sunshine now and then. I’ve been ready for a regular old pastel painting after wandering around to other media and seeing her in the sun I could feel the pastels beneath my fingers. 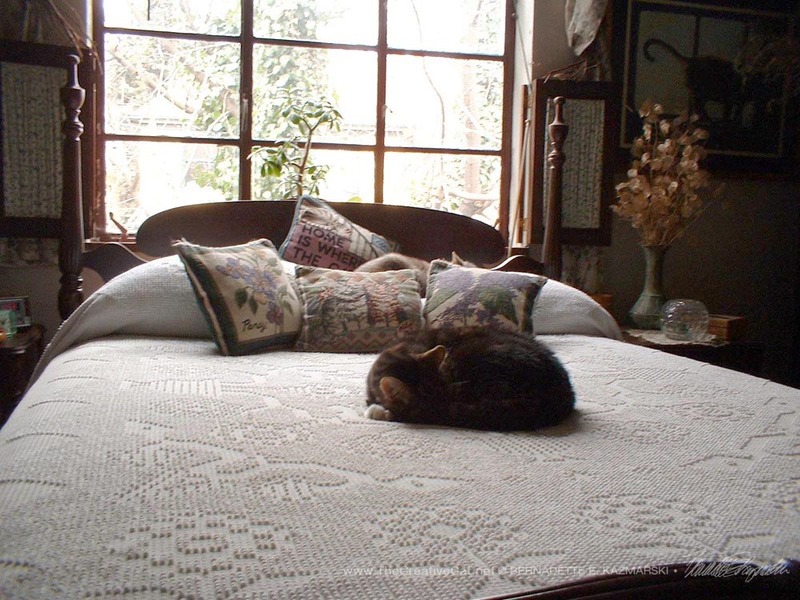 It wasn’t only Mimi and all the rich tones in her fur, but the colorful and varied shadows in the lace curtain, both creamy and cool, and the light from the window glaring pale blue and green and yellow with the hints of blue sky and promise of leaves. Yesterday morning was exceptional and full of inspiration. This is done in Sennelier soft pastels on a scrap of Wallis sanded paper in Belgian mist. 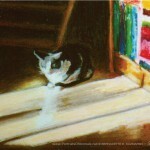 The galleries below link to the original set of feline art cards and the newer cards I’ve designed. To now all but the fully handmade cards have been commercially printed, but with the introduction of this website I am offering custom printed cards—if you’ve seen an image of one of my paintings or sketches and would like to have it as a card, you can choose from a gallery of other likely images and have a custom single or quantity of cards printed just for you (please understand some areas and galleries are still “under construction). One of the ways I’ve chosen which cards to have printed as greeting card is to see if an image is popular, and I’ll have them printed so they are always available.